It apparently is packed in an aerosol can. The back label says “CREAM is completely shelf stable and DOES NOT need to be refrigerated even after use.” The qualifications suggest that TTB wanted to check out this claim. This is canned by Temperance Distilling Company in Temperance, Michigan. For other advances in things whipped, there is Pinnacle Whipped – Whipped Cream Flavored Vodka. I tried some of this today. It is pretty good. I don’t normally like the taste of alcohol but the chocolate whipped cream was good. bought some today; makes a great spanish coffee or latte’. I just want to buy some. I found a store in canton, mi where I bought two cans and when I went back there was hardly any left and they told me it was banned from the state of Mich. Is this true? Where can I buy this exceptional product? I love it!!!!! Ok, this stuff is so good. Tried it at a local bar for a buck a shot. Found out they sell it at the local BP station for around $11/can. The chocolate and caramel are outrageous! I sat in my living room laughing like an idiot at the site of myself shoveling it down with a spoon. SUCH a guilty pleasure!!!!!! LOVE IT! I have had it a few times but heard its no longer being sold in Florida and also from personal experinece noticed the “born on date” is rather short, after that the product is said to go bad ;-( Its a must to use it all at once..
Erin, Cream I believe is just making its way down to Florida you must be talking about Whipped Lightning. I am looking for the whipped vodka in the aerosol can. I had it over the summer and would like to buy some but cannot locate it anywhere. can you tell me where in Maryland I can purchase this item. Is it legal in the state of Montana and where can I buy it here? 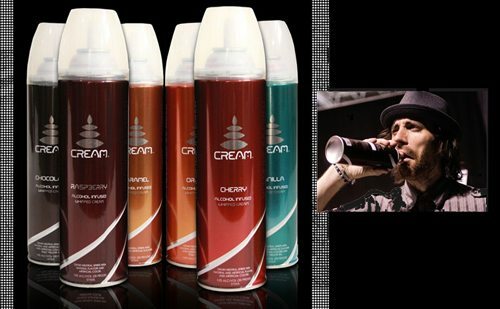 My company Western States Beverages is the California distributor for CREAM, Alcohol Infused Whipped Cream. I can tell you that this product is not “banned” or illegal in any State. If they tell you that, they are completely mistaken. If you are in an area that does not have it, you can order it from hitimewine.net or liquorama.net They do mail orders and sell it before shipping for $9.99 a can. Unfortunately, because the product is selling so quickly they are out of stock but should have more in by the end of next week. BevMo stores in California will also be carrying this product by the end of this week. You can call your local BevMo if you’re in this state and see if they have it this weekend. I’d like to know the facts about Whipahol not being available in Michigan. There are some very antiquated laws being addressed by our new Governor. I’d like to know what to tell our local State Rep and our Gov what’s keeping this interstate commerce. As a state we welcome tens of thousands of truck loads of garbage from Canada for dumping in Michigan. I don’t see how such international trade can be carried on and a domestic product can’t make it across Michigan’s state line. I would like to know also why this can’t be sold in Michigan. One reason I heard (from the store owner) was it is to accessible to children, which is a load of “you no what”. There’s liquor-infused candy being sold. People have bars in their houses with alcohol out in the open all the time. And the thing that is really sad, is that Cream is made right here in Michigan and we can’t buy it. This isn’t a dry state, is it? Would u please let me know where I can buy this in New Jersey. Where Can I buy this in Phila. They told me the Beer Distribtor. Can I get this in n.y.if not cani order it? Ok I bought it a week ago, still have a half can left but it doesnt work.Waste of money. I tryed soaking the nozzle in warm water and cleaned the nozzle. nothing comes out of it! Can you find it in New York? where can i find it in london? Both Whipahol and Cream brands are readily available in NJ. I recently saw several flavors of Whipahol at Bottle King in Glen Rock and a few flavors of Cream at Hawthorne Liquors in Hawthorne. Tried a few – good, has a kick – do NOT refrigerator or it will turn watery. The German Chocolate was great on hot chocolate and the vanilla was fantastic on a screwdriver with a dash of 43 – tasted like a creamsicle. Is there any places in or near Los Angeles where i can buy some..? been wanting it since like forever! Search for Liquor Whipped online. the website has links on where you can find the product.